Google Inc.'s $12.5 billion deal to buy cellphone maker Motorola Mobility Holdings Inc. is aimed at giving the Internet search leader more legal firepower as it battles Apple Inc. and Microsoft Corp. to gain the upper hand in the increasingly important mobile computing market. The all-cash acquisition announced Monday is the boldest move in Google's 13-year history. Besides being by far the largest deal that Google has ever proposed, buying the Motorola would push the company into phone and computer tablet manufacturing for the first time, at the risk of alienating the other device makers that depend on Google's Android operating system. The proposed deal also is likely to increase government scrutiny on Google at a time when antitrust regulators in the U.S. and Europe already are parsing its business practices to determine whether it has been abusing its power to stifle competition. The inquiries are focused primarily on the company's Internet search and advertising businesses, but regulators are also looking into whether Google using Android to ensure its s services receive preferential treatment on devices using that free software. If federal regulators approve the deal, Google CEO Larry Page's ability to avoid a clash of cultures will be tested. With 19,000 workers, Motorola Mobility's work force isn't that much smaller than Google's payroll of 28,800 employees. Google, which is based in Mountain View, Calif., is framing its Motorola acquisition as a way to protect the competitive landscape at a time when Android and the device makers using the software are facing a litany of lawsuits alleging that Google's operating system pilfered the patent-protected technology of other companies. Motorola, which introduced its first cell phone nearly 30 years ago, has more than 17,000 patents with another 7,500 still awaiting approval. That trove presumably will give Google and its Android more patent protection against a list of legal antagonists that include three of the technology industry's most powerful companies - Apple, Microsoft and Oracle Corp.
Apple and Google were once so close that Google's former CEO, Eric Schmidt sat on Apple's board. But the two companies have grown increasingly antagonistic as Android provided hardware makers with a way to counter the popularity of Apple's game-changing iPhone and iPad. The friction prompted Schmidt to resign from Apple's board two years ago. Microsoft, one of Google's bitterest rivals for years, is desperately trying to make inroads in the mobile device market. Forrester analyst John McCarthy thinks Microsoft now may try to counter Google by pursuing a long-rumored takeover of its partner, cellphone marker Nokia. Oracle is seeking billions of dollars from Google in a federal lawsuit alleging Android owes licensing fees for using the Java programming language that it acquired from Sun Microsystems. Getting Motorola's patent portfolio will "help protect Google from anticompetitive threats from Microsoft, Apple and other companies," Page told analysts during a Monday conference call. "With mobility increasingly taking center stage in the computing revolution, the combination with Motorola is an extremely important step in Google's continuing evolution," said Page, who replaced Schmidt as CEO 4 1/2 months ago. Google pounced on Motorola less than two months after a group including Apple and Microsoft joined up to pay $4.5 billion for 6,000 patents owned by Nortel, a bankrupt Canadian maker of telecommunications equipment. Leaving no doubt about the mounting antagonism among the companies, Google's top lawyer blasted Apple and Microsoft for their legal maneuvering earlier this month in a blog post titled "When patents attack Android." "We believe this acquisition was solely driven by the ongoing patent war," Sanford Bernstein analyst Pierre Ferragu wrote in a research note. Buying the patent protection will be expensive, although Google can easily afford it with $39 billion in cash. The price translates to $40 per share - 63 percent above Motorola's stock price before the deal was announced. Motorola Mobility's shares soared $13.65 to $38.12 in Monday's afternoon trading while Google shares shed $9.94 to $553.83. It's a coup for Motorola Mobility CEO Sanjay Jha and the company's largest shareholder, billionaire investor Carl Icahn, who had been pressuring Jha to cash in on the patent portfolio. Motorola Mobility, which is based in Libertyville, Ill., has been struggling for years to come up with a product that has the mass market appeal of its Razor cell phone back in 2005. The company had some success with the Droid, one of the first phones to run on Android, but it now ranks a distant eighth in the smartphone market with 4.4 million units shipped in the second quarter, according to the research firm, Canaccord Genuity. By comparison, the market-leading iPhone shipped about 20 million units. An attempt to counter the iPad hasn't paid off for Motorola Mobility either. 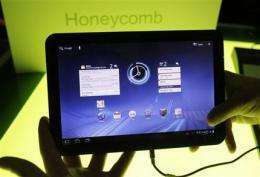 In an effort to drum up more demand, the company recently cut the price on the Wi-Fi-only version of its tablet, the Xoom, from $599 to $499. The troubles saddled Motorola Mobility with a $56 million loss in its latest quarter, pushing the company's stock price to one of its lowest points since its January spinoff from the old Motorola Inc. In contrast, Google earned $2.5 billion in its more recent quarter ending in June. Google intends to run Motorola separately from its core Internet search and advertising business. Google expects to gain the required regulatory approvals to close the deal by early next year. That's an ambitious time table, given how closely some of the company's other big deals have been vetted by antitrust regulators before gaining approval. Google's largest acquisition, a $3.2 billion purchase of online advertising service DoubleClick, was reviewed for nearly a year before it closed in 2008. Management believes regulators will sign off on the Motorola deal more quickly because Google doesn't currently make cell phones and the patents will help ensure the Android system can compete against Apple's operating system for the iPhone. "Regulatory scrutiny will likely be material," Citigroup analyst Mark Mahaney predicted Monday. The deal has the backing of other major makers of Android phones, including Samsung Electronics Co. of Korea and HTC Corp. of Taiwan, which both welcomed the acquisition in Monday statements. That support should help Google make its case with regulators. Both Samsung and HTC have their own selfish interests for supporting the acquisition. The Motorola patents could shield them from licensing demands being made by Apple, Microsoft and others who claim their usage of Android infringes on their intellectual property. Still, Google's expansion into manufacturing could complicate its relationship with some Android partners who might be worried about Motorola getting preferential treatment. "Google will move from the position of partner to that of competitor to Android handset manufacturers, potentially placing significant strain on the Android ecosystem," Ovum analyst Nick Dillon wrote in a Monday note. He believes some cellphone and tablet makers will shift to other software if they detect the slightest whiff of favoritism. Google executives stressed that the current process of selecting a different manufacture each year to showcase the latest advances in Android software will continue as before. Besides cell phones, Motorola Mobility makes cable set-top boxes, a fact that Page called "a great opportunity." Google has long been interested in bringing its search services and advertising to TV screens, but consumers have shown little interest the company's products so far. Motorola's cable box business gives Google another chance to get the software in front of viewers, but only if cable companies agree. Motorola's biggest competitor in the cable box business is Cisco Systems Inc. Wait? So, DoubleClick actually cost them more than youtube? Although in fairness youtube wasn't all that big when they lept on it. (excellent purchase, btw). Excellent! Now our mobile devices can know everything about us, all the time! Once its tattle buffers are full it will dutifully report back to its masters in easily sortable, machine readable formats. Once assimilated by the Google mother-beast, our data can be sold to the highest bidding oppressive regime, or corporation (what's the difference?) for our endless convenience. Remember consumers, it's all for YOU. I wonder how the other Android handset makers are going to feel about this. Google will tightly integrate software and hardware development and be able to release updated, polished products sooner than other handset makers will be able to. This is a big deal. Frankly, I'm just glad the odds have been evened somewhat for Android manufacturers, it really ticks me off to see companies like Apple competing in the market through litigation of questionable patents rather than innovation and pricing. Google seems to be decrying the broken patent system while simultaneously doing its level best to gather up as many exclusive patents as possible. Remember, Google only lost out on the Nortel patents because it wanted sole access to them. Google was invited to share equally the patents, but instead Google bid far, far more in an attempt at exclusive use than it would have paid to share the access to the patents equally amongst the industry. They then cried victim, claiming the exact opposite. "Apple competing in the market through litigation of questionable patents rather than innovation and pricing." I find the idea that Apple is being accused of lack of innovation with regard to smartphones and tablets highly amusing. More amusing is the fact that so very many people are re-iterating it verbatim. Saying you're not evil seems to be all that is required for people to believe it nowadays. @Temple, try reading what I wrote, I never suggested a "lack" of innovation on Apple's part, I stated that companies, such as Apple, use questionable patents instead of innovation to compete in the marketplace. Take the attempt to claim exclusive rights to the term "App Store" or the "unique" iPad design, consisting of a "rectangular product with four evenly rounded corners", this sort of mediocrity is not the behaviour of an innovative company. I stated that companies, such as Apple, use questionable patents instead of innovation to compete in the marketplace. Take the attempt to claim exclusive rights to the term "App Store" or the "unique" iPad design, consisting of a "rectangular product with four evenly rounded corners", this sort of mediocrity is not the behaviour of an innovative company. Unfortunately that sort of behaviour is required of any company that wishes to be successful under the system of trademark and patent law that exists currently. That behaviour is undertaken by all, both the 'slavish copiers' and the innovators. For example, Google has tried very hard to win exclusive use of patents for the sole purpose of retaining the competitive edge by having them. Had they been beneficent, they would have been more willing to share the patents. I don't blame Google for this behaviour, they all have to do it. That said, I don't let Google pretend they're not. The system is broken, I think we all agree.